You’re going to want to grab this coupon. 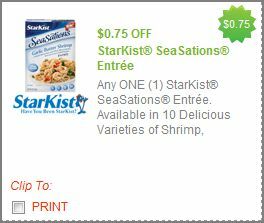 Get $0.75 Off Any ONE (1) StarKist® SeaSations® Entrée. Available in 10 Delicious Varieties of Shrimp. Next post: Get a FREE Pack of Kleenex Brand Facial Tissue.